Last week, this astrobite discussed the formation of spiral galaxies similar to the Milky Way. The authors of the study concluded that spiral galaxies do not initially form stars starting from the inside and working outwards, but rather that the central region (the bulge) forms in conjunction with the rest of the disk. In this Letter, Huang et al. 2013 compare local elliptical galaxies (Figure 1) to their distant progenitors and conclude that, unlike spirals, massive elliptical galaxies do build up stars from the “inside-out”: first in a compact core, then in the outer layers. 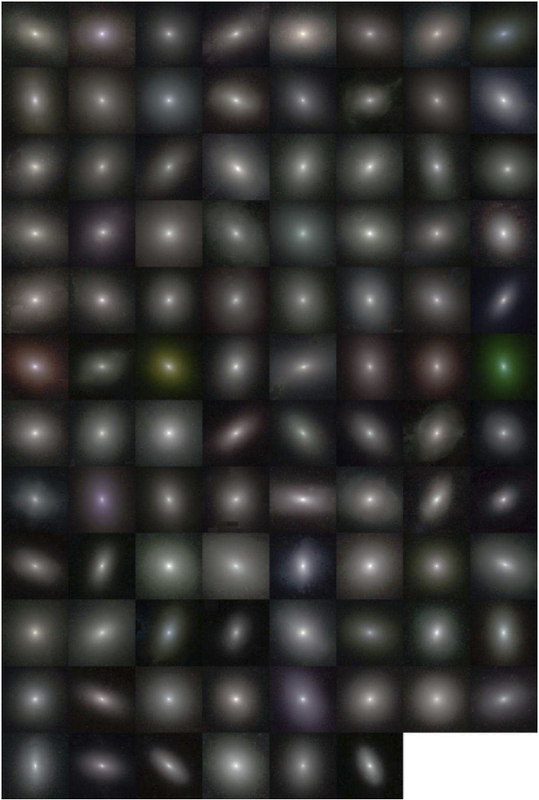 Figure 1: Local elliptical galaxies from the Carnegie-Irvine Galaxy Survey. From Huang et al. 2013a, the companion paper to this Letter. To understand why this picture makes sense, let’s look back in time. In the high-redshift universe (read: very distant and thus much younger universe, since light takes a finite time to travel to us), astronomers have observed a population of compact, massive, and red galaxies dubbed the “red nuggets”. Based on these observed properties, the red nuggets likely are a younger version of present-day elliptical galaxies. The red nuggets must have grown quickly to be so compact and massive at such an early time, and would have required a large supply of gas to create all of their stars. The authors believe the nuggets grew either through the mergers of gas-rich galaxies/protogalaxies, or by drawing in cold gas (which could easily collapse to form stars) along filaments of the universe’s large-scale structure. Something–mostly likely radiation and/or jets from the accreting supermassive black hole at the center of the galaxy–would then push out any leftover gas and prohibit the galaxy from creating new stars, as described in these astrobites. The color of the red nuggets suggests they are “dead”, i.e., done forming stars. If the red nuggets were in the process of making new stars, the bright, blue short-lived stars would outshine the dim, red, long-lived stars. Yet somehow they must gain more stars to match observations of similar galaxies leading up to the present day. Figure 2a shows that the spatial extent of the stars in red nugget-type galaxies, quantified by the effective radius, substantially increases over time. What’s more, the stellar mass of these distant red galaxies will double or even triple. How can elliptical galaxies obtain new stars without creating them internally? These authors and others suspect that the answer comes from outside; elliptical galaxies build up their outer layers by pulling in small, gas-poor satellite galaxies, in what we call “minor mergers”. Figure 2: (a) The increase in spatial extent of red nuggets/elliptical galaxies (y-axis) as a function of redshift, z (x-axis; higher z implies a larger distance). The panel on the far left shows the spatial extents of local galaxies (z=0) broken into various components. (b) The relationship between stellar mass (x-axis) and spatial extent (y-axis). The orange points–the combined inner and middle components of local ellipticals–fall on top of the grey points–the red nuggets, indicating their similarity. Huang et al. 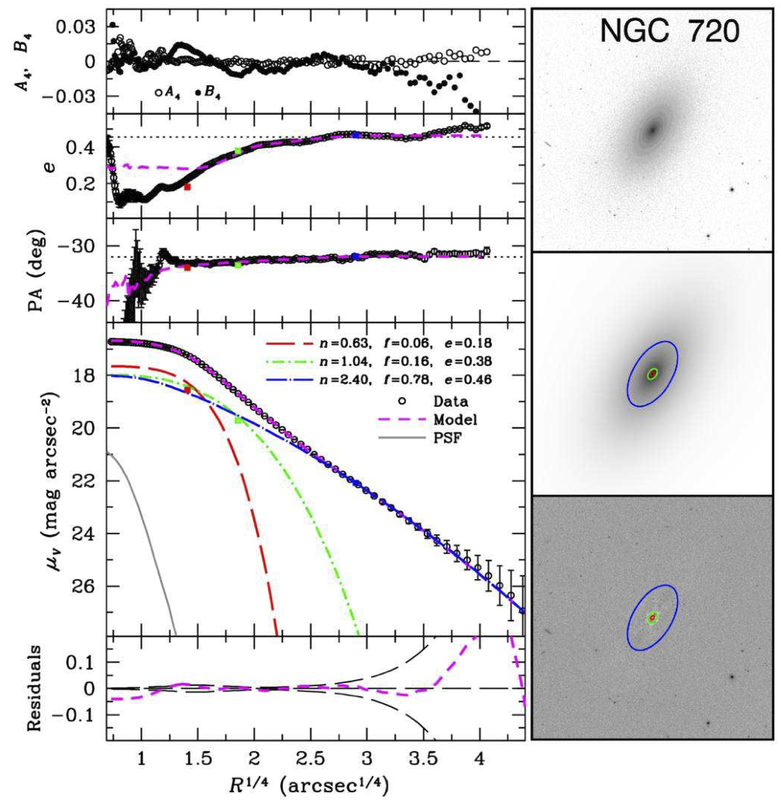 find evidence for this two-phase formation scenario lurking in local elliptical galaxies from the Carnegie-Irvine Galaxy Survey. Astronomers typically use 2-D surface brightness, i.e., what we can observe, to infer information about the 3-D stellar density. Traditionally, it was thought that an entire elliptical galaxy could be well-described by a single surface brightness profile proportional to R1/4, where R is the projected distance from the galaxy center, perhaps indicating a single formation mechanism. Here, the authors demonstrate that the surface brightness of local elliptical galaxies is better represented by three equations: two to describe the inner components, and one to describe the outer component (Figure 3). Moreover, the combined mass and spatial extent of the two inner components is strikingly similar to entire red nugget galaxies, as shown in Figure 2b. This structural evidence strongly favors a model with the two formation phases described here: one to create the red nuggets in the state at which we observe them, and another to preferentially add material to the outskirts of the galaxy later on. Figure 3: A model of one local elliptical galaxy. The top three panels on the left simply describe the detailed shape, ellipticity, and orientation of ellipses of equal surface brightness as a function of radius (to the 1/4 power); the bottom right panel shows the residuals. Most important is the 4th panel down on the right: the surface brightness as a function of projected radius from the center, where red, green, and blue curves show the three components in the model. On the right-hand side is the observed galaxy (top), the model galaxy (middle), and the residuals, i.e., what’s left when you subtract the model from the observations (bottom). Three colored ellipses show the effective extent of each component. From Huang et al. 2013a. Many details remain uncertain. Why are there two, subtly distinct inner components as opposed to just one? How are the red nuggets themselves structured; is mass already distributed like it is now, or did these early galaxies have other features (like disks) which were later destroyed? In the future, astronomers might answer these questions by decomposing the structures of these early galaxies. While this would be difficult since the red nuggets are so far away, any information we can gain would give direct insight into the early formation of elliptical galaxies. Still, unearthing the red nuggets within our close neighbors is an important step towards a complete understanding of elliptical galaxy evolution.